"e;Athens' Darling"e; tells the story of a brilliant and handsome Athenian general who falls in love with a beautiful slave girl, Timandra... 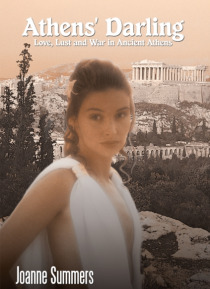 They meet at times but she is owned by Alcibiades' bitter enemy, Hiero, who revels in the knowledge that Alcibiades by Athenian law, cannot take Timandra from him. It is also the story of the Peloponnesian War between Athens and Sparta, in which Alc… ibiades rises to power and to lead the Athenian army. She is still the slave of Hiero who, with his followers are plotting to kill Alcibiades. Timandra discovers this, escapes and flees to the man she loves to warn him. Some events in Alcibiades' life in this book are based on historical fact--his appeal to women, his marriage to his first wife, the decision of the Athenians to send him to conquer Sicily, and the rise of a faction which sought to kill him. Also factual is his switching his allegiance to Sparta after this, his affair with the Spartan queen Timaea, and his return to power in Athens. Some of the characters are also actual people that lived in the 5th Century B.C., including the general Nicias and Socrates, Alcibiades' friend and mentor. Also factual are the plague that struck Athens, the accepted use of brothels, the use and abuse of slaves, and the Olympic games. What is fictional is the life of Timandra. All that is recorded about her is that she was a slave girl who was with Alcibiades when he died and arranged his funeral.